Could you or someone you know be married to a psychopath? The author of this book was, but it took her twenty years to figure it out. She wrote this book to make sure the same thing doesn’t happen to other people. 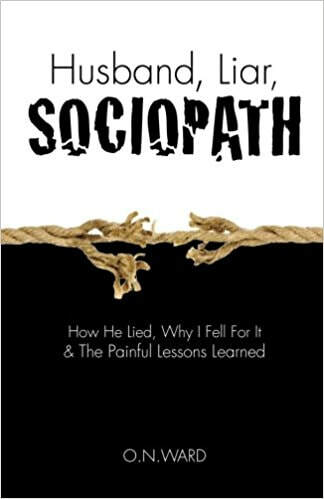 NB The term 'sociopath' is often used interchangeably with 'psychopath' although the former term is reserved by some psychologists for criminals. Onna thought the classmate she married was her Prince Charming—kind, honest, loving, and intellectually vibrant—but she was wrong. That “spark” she felt wasn’t true love, it was a trap—custom designed to ensnare her. Onna’s repayment for investing twenty years into her marriage and unwittingly providing her husband with a façade of normalcy was ongoing gaslighting and chronic emotional assault, all twisted and framed so she would attribute them to her own apparent shortcomings. By the time she understood what was really happening, her emotional, physical and financial health were in peril. Why did her husband do it? Because that’s what sociopaths do. Sociopaths are far more common than most people imagine. To help others recognize the subtle warning signs that they might be in the crosshairs of a well-camouflaged sociopath, Onna shares her story while detailing the techniques her ex-husband used to control her behavior and erode her self-esteem. She also explores the psychological research regarding why such methods are so effective, why it is hard to understand what is happening while you are in the situation, why the cumulative effect is so ruinous, and, more importantly, why you must escape if you suspect you are in a similar situation. . This insightful, cautionary tale is a must read for men and women alike. When I fell in love with Paul, a classmate at a top U.S. business school, I was confident, accomplished and optimistic. Twenty years later, as our toxic divorce punctuated the end to a corrosive marriage, none of that remained. Not a shred of confidence endured, and previous accomplishments were so distant they no longer provided a stepping stone for the future. Optimism—what is that? I had none, as I couldn’t imagine a future different from my present—searing emotional pain, suffocating fear, and the flame that is the will to live, reduced to the smallest ember. How had it happened? It happened because I am human—someone who is kind, honest, open-minded, and willing to work hard to overcome life’s problems. These qualities were turned into weaknesses because Paul was not the soulmate he pretended to be. I believe he was and is a sociopath. Sociopaths are not as rare as most of us image. Experts believe that 1%-4% of people are sociopaths. Paul did what sociopaths do, they don whatever façade is needed to draw you into their world, and then use your empathy and other positive qualities to keep you in a game designed to destroy you. Why did he do it? Confirmed by MRI studies, sociopaths are hard wired differently. They are devoid of empathy and ethics. Like the fun and satisfaction a cat gets toying with a mouse, sociopaths are fueled by your demise and emotional reaction. To keep you playing a game stacked brutally against you, sociopaths are master manipulators. They are so good at deception and subtle erosion that if you don’t know to be on guard for them and recognize the techniques they use, you could end up like me—with a tale of being married to the devil, fearing for the fate of your children, and needing to rebuild yourself from all that remains—dust. NB Identifying names, places, events, characteristics, etc discussed here and in the book have been altered to protect the identity of everyone involved.